BBC NEWS | Health | Did microwaves 'spark' obesity? Microwaves may be to blame for kick-starting the obesity epidemic, a UK scientist suggests. Professor Jane Wardle says obesity rates started to rise soon after 1984 - around the time of the rapid spread of microwave ownership. The mid-1980s also saw the first ready-meals appearing in shops. It is one of three theories being debated at Cheltenham Science Festival - alongside the rise of the supermarket and the end of the Second World War. 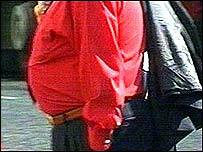 In 1980, 8% of women and 6% of men were classified as obese. By 2004 this had increased to 24% of men and women. Children are also suffering from increased levels of obesity, with 16% of children aged two to 15 classed as obese in 2003 compared with 10-12% in 1995. Experts blame diets high in fat and calories combined with reduced levels of physical activity. It is often reported that previous generations had a higher calorie intake but were much more active and had physically demanding jobs. The three experts taking part in the debate were asked to determine when the nation's waistline began to expand and what the trigger was. Professor Wardle who is professor of clinical psychology at University College London said: "I looked at the figures showing rates of obesity in the population over many years and it seem very clear it began between 1984 and 1987. She added that food also became cheaper and ready meals began to appear on supermarket shelves. "I'm not trying to demonise the microwave but it was emblematic of a change that took place in the 1980s in terms of the availability of food - a real change in the disincentives for eating." Also taking part in the debate is Professor Tim Lang, professor of food policy at City University in London argues that the introduction of the supermarket is to blame. "Co-op introduced the supermarket retail format to Britain, heralding the late 20th century food revolution in which prices have tumbled, car use rocketed, physical activity plummeted and the NHS was born which picks up the pieces." Professor Ken Fox, professor of exercise and health science at the University of Bristol says the current obesity epidemic can be tracked back to 1945 and the end of the Second World War. "The end of the war saw technology starting to replace physical effort in both work and leisure." Dr David Haslam, clinical director of the National Obesity Forum said all the theories could have contributed to rising levels of obesity and there was no one cause. "Microwaves are a double-edged sword because they are also a very healthy way of cooking food and supermarkets sell healthy food if people choose to buy it." He said the end of the Second World War could be important because of the end of rationing. "We're the only generation where there's never been a shortage of food, so that's a major thing."